You always wanted to compose a song to sing to your loved one, or a soundtrack to your latest holiday video.Well now is your chance and I will show you how to make magic on this fun, easy to use music creation software that comes bundled for free when you buy a new Mac computer. I will also show you how to create tunes in Garage Band on your new iPad in no time at all. You can play the instruments directly from you iPad using the touch screen. You can pluck your guitar strings, and even bend them like a real guitar.You can play the drums by tapping on the various drums as they appear on your screen. If you are not familiar with playing a musical instrument you can use one of Garage Bands smart instruments which with the touch of a key will play a whole beat or sequence of chords for you making you sound like a seasoned veteran.You then press record and voila, it’s captured on hard drive.You can export you masterpiece as an mp3 once you are finished for all to hear. 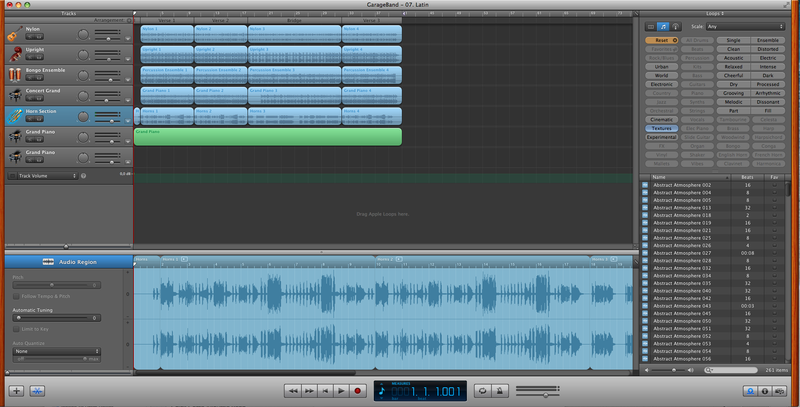 Just because Apple ships GarageBand as a free application doesn’t mean it’s not a very powerful music creation tool. You’ll be amazed at what you are able to create and in a short space of time you might have delusions of grandeur that you are the next Babyface or Quincy Jones. You might say that it is the baby brother of it’s more powerful sibling Logic Pro but take nothing away from this extremely versatile programme. A lot of the features you find in GarageBand are found in Logic Pro and learning to use this programme will prepare you for the step up to Logic. GarageBand comes with it’s own software instruments, I bet you didn’t realise that with your new Mac you also purchased a whole band in a box along with recording and playback facilities that 20 years ago, people only dreamt about.